PlanetSide 2 is a free to play shooter that aims to capture the feeling of massive combat engagements. Players will get to control a huge variety of vehicles and classes as they battle it out against hundreds and sometimes thousands of players. In the game you’ll have to swear allegiance to one of the three factions in the game which are fighting each other for control of continents and resources. Factions include the New Conglomerate, Vanu Sovereignty and the Terrain Republic, each of these factions has their own strengths and weaknesses for players to consider. The New Conglomerate features hard hitting guns with lower magazine clips with solid vehicles and aircraft. The Terrain Republic prefer fast firing weapons with large magazine sizes and have some of the fastest moving vehicles in the game. Finally the Vanu Sovereignty uses alien lasers which provide high accuracy and low recoil. Considering the strengths of your own faction and the enemy plays a surprisingly large role in the gameplay of PlanetSide 2. 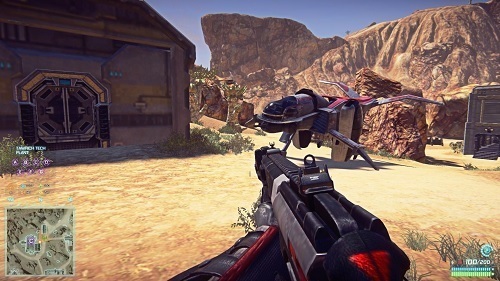 PlanetSide 2 combat takes place across multiple territories which players fight for control over against other players. If players are able to take control over a territory for their faction they’ll unlock small boosts for their faction. 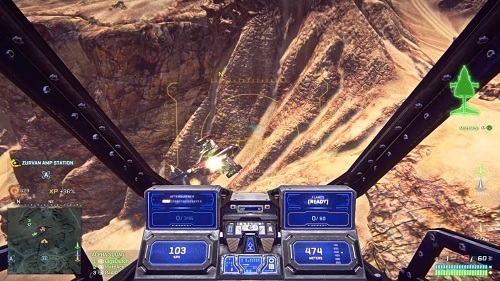 These combat sequences can contain thousands of other players and aren’t just limited to soldiers as battles will also involve a wide range of vehicles and aircraft. Every action in the PlanetSide 2 universe will give the player some in game currency which is then used to customise their classes, weapons and skins. This process can be significantly enhanced through the premium game currency of Station Cash which does provide an advantage to paying players although not directly as all free playing players have the same options. A MMOFPS experience with huge battles. Use land and air vehicles on your way to victory. Choose from one of three factions each with their own strengths. Customise your classes with a variety of weapon options. A free to play experience of epic scale.